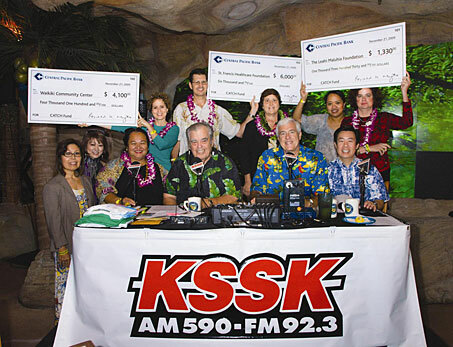 Honolulu, Hawaii — During the KSSK Perry and Price live radio broadcast at Jimmy Buffett’s, Ohana Waikiki on Saturday, November 21, HHSC Oahu region community relations manager Lydia Chock was presented with a $1,330 check from Central Pacific Bank for the development of a small garden in the Maluhia Adult Day Health Center. The award is given each year to non-profit organizations that want to develop worthy community improvement projects. The Maluhia garden was one of three projects selected to be funded by the Central Pacific Citizens Against Troublemakers and Criminals In Hawaii Fund. The CATCH award was also presented to the St. Francis Healthcare Foundation and the Waikiki Community Center. For every crime incident resolved by the Posse (radio listeners) of KSSK radio, CPB donates $1,000. CPB donates close to $10,000 each year. Maluhia is one of 12 facilities operated and managed by the Hawaii Health Systems Corporation (HHSC). Established in 1996, HHSC is a public benefit corporation of the State of Hawaii. As the state’s safety-net healthcare system, HHSC continues to fulfill the state’s promise to provide quality, hometown healthcare.